Few nations on Earth have had a more colorful history than Japan. Settled by migrants from the Asian mainland back in the mists of prehistory, Japan has seen the rise and fall of emperors, rule by samurai warriors, isolation from the outside world, expansion over most of Asia, defeat, and rebirth. One of the most war-like of nations in the early 20th century, Japan today often serves as a voice of pacifism and restraint on the international stage. Japan has a constitutional monarchy, headed by an emperor. The current emperor is Akihito; he wields very little political power, serving primarily as the symbolic and diplomatic leader of the country. The political leader of Japan is the Prime Minister, who heads the Cabinet. Japan's bicameral legislature is made up of a 465-seat House of Representatives and a 242-seat House of Councillors. Japan has a four-tier court system, headed by the 15-member Supreme Court. The country has a European-style civil law system. Shinzō Abe is the current Prime Minister of Japan. Japan is home to about 126,672,000 people. Today, the country suffers from a very low birth rate, making it one of the most rapidly aging societies in the world. The Yamato Japanese ethnic group comprises 98.5 percent of the population. The other 1.5 percent includes Koreans (0.5 percent), Chinese (0.4 percent), and the indigenous Ainu (50,000 people). The Ryukyuan people of Okinawa and neighboring islands may or may not be ethnically Yamato. The vast majority of Japan's citizens (99 percent) speak Japanese as their primary language. Japanese is in the Japonic language family, and seems to be unrelated to Chinese and Korean. However, Japanese has borrowed heavily from Chinese, English, and other languages. In fact, 49 percent of Japanese words are loanwords from Chinese, and 9 percent come from English. Three writing systems coexist in Japan: hiragana, which is used for native Japanese words, inflected verbs, etc. ; katakana, which is used for non-Japanese loanwords, emphasis, and onomatopoeia; and kanji, which is used to express the large number of Chinese loanwords in the Japanese language. Most Japanese citizens practice a syncretic blend of Shintoism and Buddhism. Very small minorities practice Christianity, Islam, Hinduism, and Sikhism. The native religion of Japan is Shinto, which developed in prehistoric times. It is a polytheistic faith, emphasizing the divinity of the natural world. Shintoism does not have a holy book or founder. Most Japanese Buddhists belong to the Mahayana school, which came to Japan from Baekje Korea in the sixth century. In Japan, Shinto and Buddhist practices are combined into a single religion, with Buddhist temples being built at the sites of important Shinto shrines. The Japanese archipelago includes more than 3,000 islands, covering a total area of 377,835 square kilometers (145,883 square miles). The four main islands, from north to south, are Hokkaido, Honshu, Shikoku, and Kyushu. 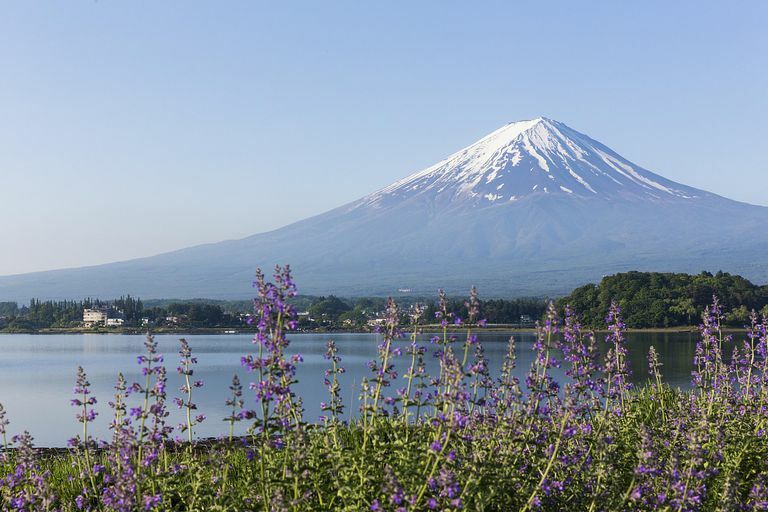 Japan is largely mountainous and forested, with arable land making up only 11.6 percent of the country. The highest point is Mount Fuji, at 3,776 meters (12,385 feet). The lowest point is Hachiro-gata, which sits at four meters below sea level (-12 feet). Positioned astride the Pacific Ring of Fire, Japan features a number of hydrothermal features such as geysers and hot springs. The country suffers frequent earthquakes, tsunamis, and volcanic eruptions. Stretching 3,500 km (2,174 miles) from north to south, Japan includes a number of different climate zones. It has a temperate climate overall, with four seasons. Heavy snowfall is the rule in the winter on the northern island of Hokkaido; in 1970, the town of Kutchan received 312 cm (over 10 feet) of snow in a single day. The total snowfall for that winter was more than 20 meters (66 feet). The southern island of Okinawa, in contrast, has a semi-tropical climate with an average annual temperate of 20 Celsius (72 degrees Fahrenheit). The island receives about 200 cm (80 inches) of rain per year. Japan is one of the most technologically advanced societies on Earth; as a result, it has the world's third largest economy by GDP (after the U.S. and China). Japanese exports include automobiles, consumer and office electronics, steel, and transportation equipment. Imports include food, oil, lumber, and metal ores. Economic growth stalled in the 1990s, but since has rebounded to a quietly respectable 2 percent per year. Per capita GDP in Japan is $38,440; 16.1 percent of the population lives below the poverty line. Japan was settled about 35,000 years ago by Paleolithic people from the Asian mainland. At the end of the last Ice Age, about 10,000 years ago, a culture called the Jomon developed. Jomon hunter-gatherers fashioned fur clothing, wooden houses, and elaborate clay vessels. According to DNA analysis, the Ainu people may be descendants of the Jomon. The second wave of settlement by the Yayoi people introduced metal-working, rice cultivation, and weaving to Japan. DNA evidence suggests that these settlers came from Korea. The first era of recorded history in Japan is the Kofun (A.D. 250-538), which was characterized by large burial mounds or tumuli. The Kofun were headed by a class of aristocratic warlords; they adopted many Chinese customs and innovations. Buddhism came to Japan during the Asuka period, 538-710, as did the Chinese writing system. At this time, society was divided into clans. The first strong central government developed during the Nara period (710-794). The aristocratic class practiced Buddhism and Chinese calligraphy, while agricultural villagers followed Shintoism. Japan's unique culture developed rapidly during the Heian era (794-1185). The imperial court turned out enduring art, poetry, and prose. The samurai warrior class developed at this time as well. Samurai lords, called "shogun," took over the government in 1185, and ruled Japan in the name of the emperor until 1868. The Kamakura Shogunate (1185-1333) ruled much of Japan from Kyoto. Aided by two miraculous typhoons, the Kamakura repelled attacks by Mongol armadas in 1274 and 1281. A particularly strong emperor, Go-Daigo, tried to overthrow the shogunate in 1331, resulting in a civil war between competing northern and southern courts that finally ended in 1392. During this time, a class of strong regional lords called "daimyo" increased in power; their rule lasted through the end of the Edo period, also known as the Tokugawa Shogunate, in 1868. That year, a new constitutional monarchy was established, headed by the Meiji Emperor. The power of the shoguns came to an end. After the Meiji Emperor's death, the emperor's son became the Taisho Emperor. His chronic illnesses kept him away from his duties and allowed the country's legislature to introduce new democratic reforms. During World War I, Japan formalized its rule over Korea and seized control of northern China. The Showa Emperor, Hirohito, oversaw Japan's aggressive expansion during World War II, its surrender, and its rebirth as a modern, industrialized nation.